Maybelline New York's Wonder Finish is the product selected for this Maybelline foundation review. 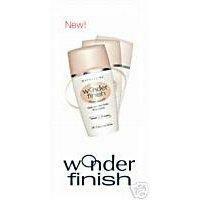 Wonder Finish is a liquid-to-powder foundation, going on your skin like a liquid and drying into a powder. As a woman who has always fought the perils of over-active oil glands, I am always on the hunt for a simple formula to solve my shiny day woes. After years of applying face powder to an almost cake-like consistency, I knew there must be a better way. Then, one day, I stumbled upon Wonder Finish and this Maybelline Foundation review was born. Based on the company's claims, this product appeared to be my magic trick waiting to happen. Designed to be a liquid foundation and weightless powder in one, it should provide the staying power of a liquid and the oil control of a powder. Thus, creating a true Wonder Finish overall skin appearance. This Maybelline foundation is trickier to apply than I expected. Because it dries to a powder consistency quite quickly, you have to blend it on your skin rapidly before it has a chance to dry. Once the foundation has dried, it will not move or blend without removing it entirely. The best method is to apply a little at a time to a small area or use a moistened makeup sponge. Maybelline advertises Wonder Finish foundation to offer a medium coverage, which I found to be true. If applied directly to the skin with a finger tip, this foundation will cover most minor imperfections or variations in skin color. If you want more control, this foundation works better with a moist sponge. You can then add the foundation in thin layers on the skin, lightly covering your complexion and also adding a bit more coverage for imperfections. This provides a more natural appearance overall. As a baseline, Wonder Finish performed adequately for all day coverage during this Maybelline foundation review. The more often the face was touched or rubbed, the gradual reduction in coverage occurred. In most cases, the whole application process did not need to be repeated. Simply dabbing on the trouble areas once or twice throughout the day maintains the foundation's base. Of all the foundation products I have tried, Wonder Finish provides the best in oil control. At no point was the foundation cake-like, but it did keep the serious greasies away. I still applied powder to my trouble spots, like the t-zone, and to help set my makeup. Overall the dual action of the face powder and this Maybelline foundation managed the shine very effectively.